Google Maps savvily takes advantage of direct and indirect network effects to remain the Big G on the streets. 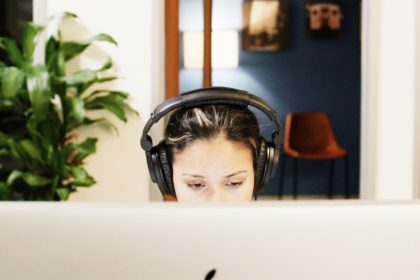 This post was originally published on the Digital Initiative’s public blogging platform, Open Knowledge. Google Maps has evolved into a platform boasting powerful direct and indirect network effects. In October 2004, Google acquired Sydney-based Where 2 Technologies to create web application Google Maps . At the time, it may have seemed that Google Maps was purely a product/service-centric tool?—?after all it provided users with a way to map locations and navigate to their destinations. However, over the years, Google Maps has transformed into a platform boasting powerful network effects. Google’s effort to map the world has been nothing short of monumental. The continuous mapping effort (described in fascinating detail here), has required an incredible amount of human capital invested in driving 5+ million miles all over the world to track roads and take Street View pictures, as well as coding, and manually cleaning up data based on thousands of reports of problems that Google Maps users send in every day . However, today’s Google Maps would not have been possible without powerful direct network effects acquired through the app’s large user base. Google has utilized data collected from hundreds of millions of users over several years to improve its maps’ functionality . Their product MapMaker allows users to edit maps, adding landmarks and data, and correcting errors . Even the aforementioned problem reports are a product of network effects?—?without a large user base, there would be no problem reports, and without those problem reports, the product wouldn’t improve! Google Maps has also benefited from indirect network effects between its user base and 3rd party customers. 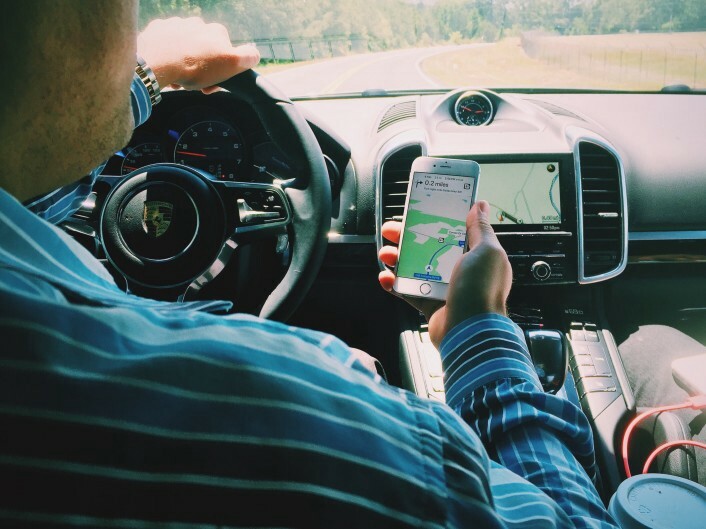 3rd party customers include businesses advertising on Google Maps, as well as popular companies utilizing Google Maps’ API as a core element in their own product (such as Uber, Lyft, Yelp, and Airbnb). Google’s head start and seemingly massive barriers to entry haven’t deterred competitors. In 2012, Apple released its own mapping app as a feature of the new iOS 6, replacing Google Maps on iPhones. Apple Maps’ launch turned out to be disastrous due to major flaws in its functionality, bringing about widespread criticism to Apple. Waze, another competitor, primarily relied on user-generated data to map cities and provide real-time traffic data. Waze was acquired by Google in 2013 for over $1bn . And last year, Uber announced a $500m investment to map the world’s roads (with autonomous vehicles in mind) . 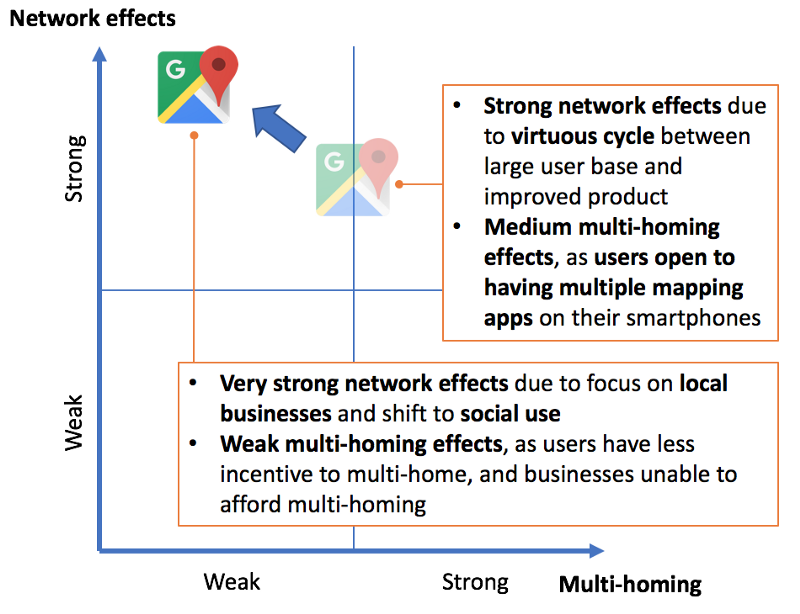 In order to quell competition and maintain their dominance in the market, Google has undertaken several steps to strengthen network effects of their own maps app, and weaken multi-homing effects to discourage users (and 3rd party customers) from turning to competitors. As mentioned above, Google has relied on its user base to improve its product. Google searches (through web and app) guides customers to 1.5 billion destinations every year . Its recent acquisition of Waze, which primarily relies on user-generated data, further signals Google’s intent on leveraging direct network effects to keep its product superior to its competitors. Google recently announced the “next generation” of local search ads . In the announcement, Google pointed out that ~90% of all global sales happen in stores (as opposed to online), and that location-related searches have been growing 50% faster than overall mobile searches . Accordingly, the new effort aims to make local businesses more visible on Google Maps through new ad formats. These formats include Promoted Pins (shown below), in-store promotions, customizable business pages, and local inventory search . 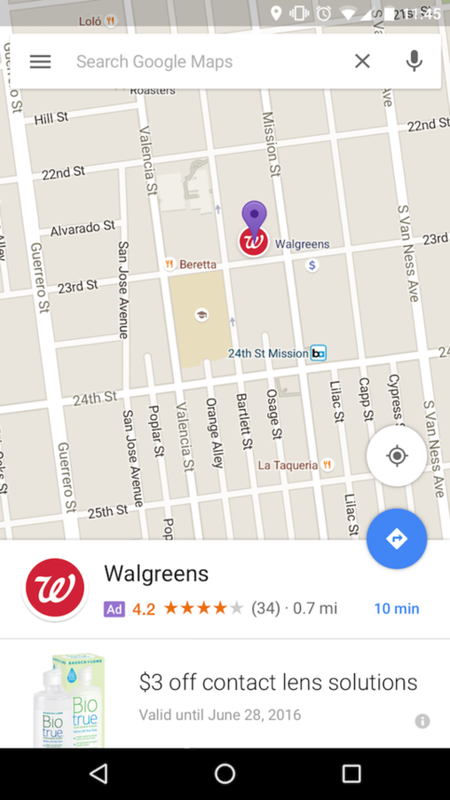 Earlier this year, Google introduced its latest feature to Google Maps: Lists. Lists allows users to mark their favorite locations, organize them customizable lists, and share those lists with friends (see video below). 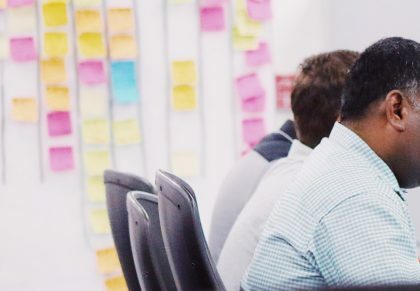 This has the potential of increasing user interaction on the app, thereby driving both direct (user side) and indirect (business and 3rd party side) network effects. As a by-product of the direct and indirect network effects mentioned above, Google has made multi-homing less attractive for both the demand side (users), as well as the supply side (3rd party customers and business). On the user side, as the app becomes more social, and one’s social network becomes concentrated on one platform, there is less incentive to use multiple mapping apps simultaneously. Similarly, local businesses will find no incentive spending their precious ad dollars on multiple mapping apps, when they know that over a billion people are on Google Maps . The matrix below illustrated the shift of Google Maps towards stronger network effects and weaker multi-homing, fortifying its position against competition. Ali is a student in the Harvard Business School’s MBA program.